Originally developed by Kenner and currently owned by Hasbro, Littlest Pet Shop (LPS) is a popular children's franchise that boasts an extensive toy line. With more than 3,000 numbered pets and playsets released since 2005, there's a toy to fit nearly every age group, interest, and budget. 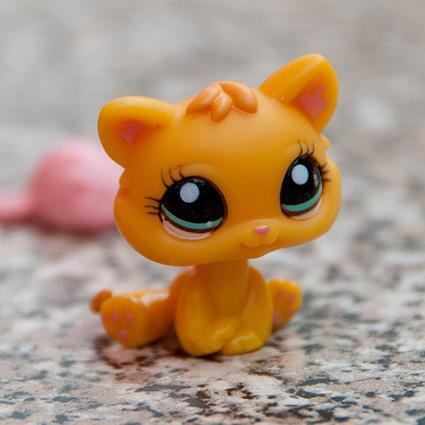 Take a glimpse into the exciting Littlest Pet Shop universe. Playsets include lots of accessories and some pets, so they make great gifts for any young fan. Littlest Pet Shop Say Ahh to the Spa Style Set: This adorable, spa-themed playset features easy-glide panels that allow children to change the spa scenes, as well as stickers and Deco Bits to give their spa a custom look. 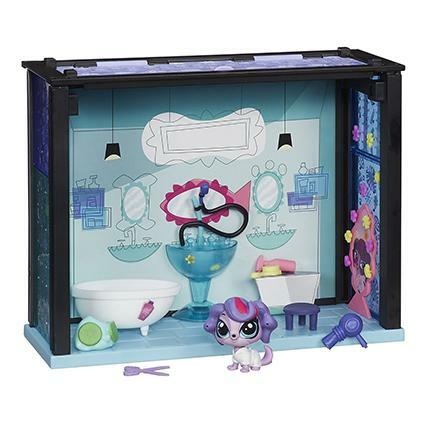 The Littlest Pet Shop Say Ahh to the Spa Style Set also features a sassy Zoe Trent pet, bathtub, scissors, hair dryer, and other accessories that allow children to treat their pets to an afternoon of primping and pampering. Designed for children ages 6 and older, the playset sells for around $15. 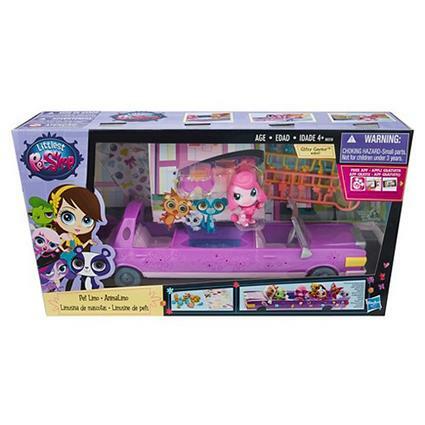 Littlest Pet Shop LPS Jet: When these trendy pets travel, they know how to do it in style! The playset features a cute jet that opens up into an extended play area as well as stickers and Deco Bits that allow children to personalize the jet's design. There are more than 40 accessories, including a slide, three hanging swings, and a pet feeder. The Littlest Pet Shop LPS Jet also includes four exclusive pets: a monkey, tiger, kitten, and bird that children can take on imaginative adventures. For children ages 4 and older, this playset sells for approximately $40. Littlest Pet Shop Slide-and-Dive Lagoon Playset: Perfect for use both in or out of the water, this adorable LPS playset features a water slide that empties into a beautiful blue lagoon, and a motorized penguin pet that walks, waddles, and moves on his belly. The Littlest Pet Shop Slide-and-Dive playset also has an attached dance floor where the penguin can show off his moves. Designed for children ages 4-8 years old, the playset sells for around $30. The Littlest Pet Shop toy line features a wide range of pets -- both plastic and plush. Almost every imaginable type of animal is available, from dogs and cats to more exotic pets such as spiders and seals. Littlest Pet Shop Poodle and Baby Poodle: This adorable LPS two-pack features a mom and baby poodle along with a mirror accessory. These plastic toys can be used in conjunction with any LPS playset or played with on their own. Pretend to style their "hair" or take them on an adventure! For ages 4 and up, this duo sells for around $5. Littlest Pet Shop Bird and Baby Bird Pets: Another set of plastic LPS pets, this mom and baby bird pair comes with a butterfly pacifier for the baby. Great for imaginative play, this set is recommended for children ages 4 and older, and sells for around $5. 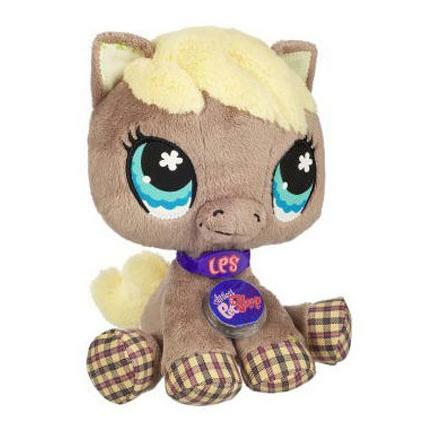 Littlest Pet Shop Virtual Interactive Horse Pet: Not just a plush toy, this cute horse has a secret code hidden in its collar that allows children to access a world of virtual Littlest Pet Shop fun! With the Littlest Pet Shop Virtual Interactive Horse Pet, children can play with their pet online, unlocking a variety of exclusive games and activities. Recommended for children ages 3 and older, this interactive pet sells for under $15. Littlest Pet Shop Plush Spider: This 6-inch soft plush spider has a charming grin and friendly eyes. Great for snuggling or cuddling, the Littlest Pet Shop Plush Spider is designed for children ages 3 and older, and sells for less than $10. Littlest Pet Shop Bobble-Head Pets: A perfect introduction to the Littlest Pet Shop universe, this collection features 10 plastic bobble-head pets including a frog, greyhound puppy, pig, mouse, and baby deer, along with accessories such as a skateboard and picnic basket, all packed into a zippered tote. Recommended for children ages 4-7, the set sells for around $70. Littlest Pet Shop Stylin' Sweeties: A great addition to the Littlest Pet Shop Salon, this adorable set features prairie dog and poodle pets along with their bee and basset hound friends, and a mirror, hair dryer and other accessories that are perfect for primping. For children ages 4 years and up, this set is reasonably priced at around $15. From playset accessories to surprise toys, there are plenty of other toys to supplement playsets and pets. Littlest Pet Shop Limo: This classy purple stretch limo ensures that Littlest Pet Shop pets arrive at their destination in style. The limo comes with an array of Deco Bits, so that children can personalize the vehicle, as well as a fancy hot tub. For children ages 4 and older, the Littlest Pet Shop Limo sells for around $15. The Littlest Pets Collection Blind Bags: Blind bags can be lots of fun for kids. These LPS bags contain one pet, one accessory, and one Deco Bit, all of which are completely random. They're recommended for children over 3 years of age and cost less than $3. Littlest Pet Shop Sweet Delights Treat Truck: A stylish pink truck that lets pets take a turn in the driver's seat, the Littlest Pet Shop Sweet Delights Treat Truck includes a turntable with treat accessories, a chute for treats, and an exclusive sugar sprinkles pet. Enjoy the vehicle on its own or with other Littlest Pet Shop pets and playsets. Designed for children ages 4 and older, the truck sells for about $30. The franchise also includes a number of games, including several board games, a video game, and numerous apps. Littlest Pet Shop Friends video game: Available for the Nintendo Wii and DS, the Littlest Pet Shop Friends video game allows players to collect a wide range of all-new pets and dress them in clothing and accessories they've designed themselves. The game also has a variety of mini games to help guide players through the story and two-player multi-player support. Rated "E" for everyone, the game sells for approximately $15 or less. 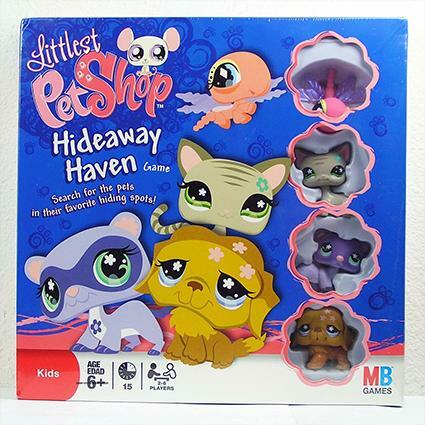 Littlest Pet Shop Hideaway Haven Game: In this adorable board game, the Littlest Pet Shop pets are hiding in their favorite hiding spots when it's time to go home. Players move to different locations on the board in an attempt to be the first to round up their pets. The Littlest Pet Shop Hideaway Haven Game comes with the game board, as well as dragon fly, tiger, St. Bernard and ferret pawns. For ages 6 and up, this game sells for around $30. Littlest Pet Shop Wild Card Game: Featuring a wide range of Littlest Pet Shop characters, this game includes instructions for three different card games designed for children ages 7-15. The game sells for about $15. Littlest Pet Shop Guess Who? : A Littlest Pet Shop-themed version of the classic "mystery face" game, this board game encourages players to use the process of elimination to determine which pet their opponent is holding. Older Littlest Pet Shop pets and playsets can often be found on Amazon or online auction sites, such as eBay. Budget-conscious Littlest Pet Shop enthusiasts can also check second-hand stores or neighborhood garage sales to potentially find a better deal. This adorable collection of pets continues to dominate toy store shelves and top the birthday and holiday wish lists of young girls and boys alike. With Hasbro releasing new pets and playsets regularly, there's always more to explore in the Littlest Pet Shop universe.